The Chamber 2018 Annual Meeting and Dinner was held at the Knights of Columbus on Thursday, February 7, 2019. 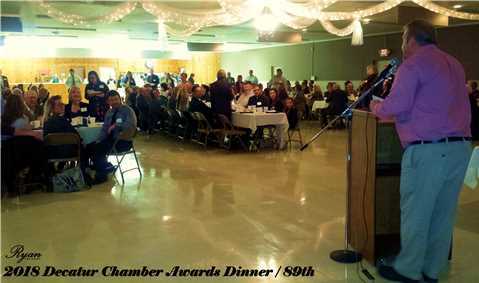 Craig Coshow served as Master of Ceremonies and conducted the business portion of the meeting. In the business portion, the members affirmed the 2019 Chamber board of directors and officers. They are: Dane Wheeler (Adams Memorial Hospital), president; Ron Storey (Kelley Automotive), past president; Penny Parrish (First Bank of Berne), Treasurer; Mariea Moreland (Gold Shield), VP of Industrial; Joel Massoth (Decatur Package Liquor), VP of retail; and Dean Fuelling (First Merchants Bank), VP of Professional. Board Members are: Pam Bergdall (Bear's Den Embroidery & More); Greg Farmer (Walmart); Blake Fuelling (Bunge North America); Andy Gay (Corner Café); Trevor Hobbs (Adams Co Economic Development Corp); Brent Lehman (North Adams Community Schools); Adam Lengerich (Lengerich Chiropractic); Ken Meyer, Mayor, (City of Decatur); Justin Miller (Kelley Automotive); Jeremy Porter (Thunderbird Products); Louise Ray (Don Ray Drive-a-Way); SueAnn Reynolds (Family LifeCare); and Wylie Sirk (Decatur Main Street). Joel Massoth presented the President’s Award to Dean Fuelling for outstanding service to the Chamber. The Large Business Award was presented to The Bank of Geneva and the Small Business Award was presented to ABCinema. Susan Zurcher received the Stephen Decatur Award.